Chemical strippers, pressure washers and good old fashioned manual stripping with a paint knife all remove old and peeling paint, but only a few of these options strip paint without creating lasting damage to the under-surface or creating a toxic environment for the worker. 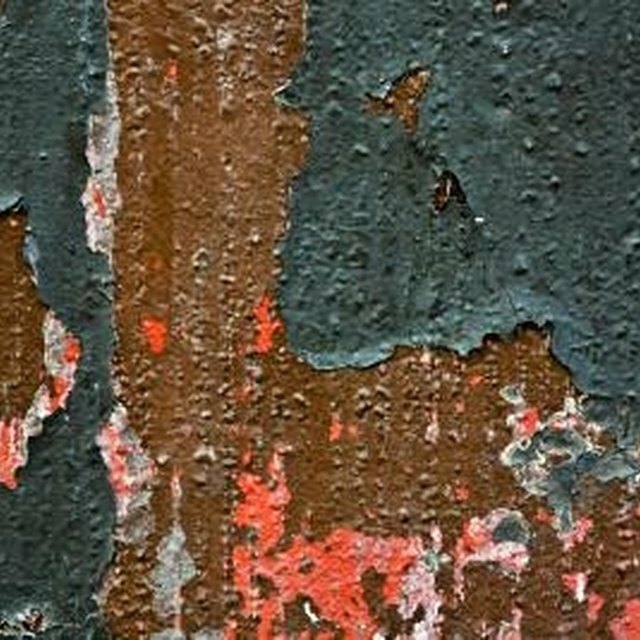 Cracked and peeling paint on wood. Chemical strippers, pressure washers and good old fashioned manual stripping with a paint knife all remove old and peeling paint, but only a few of these options strip paint without creating lasting damage to the under-surface or creating a toxic environment for the worker. Removing old paint is labor intensive no matter how it's done, thus it's best to choose a method that leaves the under-surface in the best condition. Simple hand scraping and sanding is the best way to remove peeling paint, whether the peeling is due to water damage, incompatible paint or just age, and works equally well for surfaces that are concrete or wood, old and fragile or new and sturdy. It's also the healthiest alternative for the environment and the user. Use tarps if stripping paint outside to cover all plants and ground under and directly around the area to be scraped to prevent contamination of plants, soil and ground water. Cover all doorways if scraping inside that access the stripping area and turn off all air conditioning and fan units to prevent spreading dust throughout the structure. Use painter's tape to attach the tarps to outside walls and inside door jams to prevent the tarps from shifting. Prepare to start scraping old paint at the highest point necessary while the person or people working are the freshest and have the most energy. Set the ladder under this point. Choose the scraper knife blade from the knife kit that best matches the contours of the scraping target area, as kits typically have multiple blades to choose from that are made for different surface shapes, such as flat wood versus moulding. Put on the lead paint dust mask and the gloves. Take the scraper knife and climb to a safe height on the ladder, if using a ladder. Hold the scraper knife blade at a 45-degree angle against the painted surface and rake it against the surface in short upward movements with only enough pressure to separate the peeling paint from the under-surface. Reposition the ladder and continue scraping in short, upward movements until all the highest area is scraped. Continue working in the same manner until all old and peeling paint is removed. Connect the sander to an extension cord if necessary and sand the scraped area with a small electric hand-held sander with sandpaper grit appropriate for the material comprising the surface. Fill any places on the surface uneven to the extent they are out of character with the surface's natural texture with filler appropriate to the composition of the surface and a spackling knife. Allow the filler to set up and dry completely. Don't climb to or stand at the very top of a ladder. If the area to be stripped reaches higher than a ladder safely reaches, rent scaffolding from a tool and heavy equipment rental store. What Accent Color With Light Green?